Following the teaser image of a rally-prepared Proton Iriz, here’s the first full-car image of the Iriz R5 as shown in Furancho Racing’s Instagram post. Details on the new rally car are scarce, but given its R5 moniker, the rally-going Iriz can be expected to comply to R5 class regulations, which dictate the use of 1.6 litre, turbocharged engines mated to all-wheel-drive, along with a minimum weight of 1,230 kg. 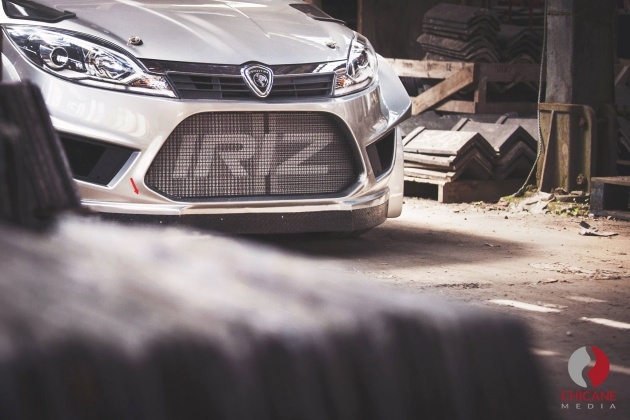 The headlamps and grille from the roadgoing Iriz appear to have made it to the R5 car, with the integrated front bumper and front fenders headed by a large central air intake with an “IRIZ” script on the mesh. Adding on to the rally car look are the roof-mounteed air scoop and carbon-fibre side mirrors, as well as the eye-catching wheelarch extensions for the wider wheel/tyre combination and increased clearance. As can be seen here, the Iriz R5 currently wears plain silver paintwork in place of a full racing livery, though it does have Proton decals along the sides and the top of its windscreen. Presumably set to contest the WRC-2 class (R5 regs make it eligible), the team behind the Iriz R5 will surely be looking to follow up the successes of the Satria S2000, which took rally driver Alister McRae (younger brother to the late, great Colin McRae) to an APRC title in 2011. What do you think of the Iriz R5? Would you like to see a high-performance Iriz, perhaps breathed on by R3? Sound off in the comments section below.